A blood pressure of less than 130/85 (say "130 over 85") is normal for an adult. High blood pressure is 140/90 or higher. You have high blood pressure if your top number is 140 or higher or your bottom number is 90 or higher, or both. Try to limit how much sodium you eat to less than 2,300 milligrams (mg) a day. And try to limit the sodium you eat to less than 1,300 mg a day if you are 51 or older, are black, or have high blood pressure, diabetes, or chronic kidney disease. Buy foods that are labelled "unsalted," "sodium-free," or "low-sodium." Foods labelled "reduced-sodium" and "lightly salted" may still have too much sodium. Flavour your food with garlic, lemon juice, onion, vinegar, herbs, and spices instead of salt. Do not use soy sauce, steak sauce, onion salt, garlic salt, mustard, or ketchup on your food. Use less salt (or none) when recipes call for it. You can often use half the salt a recipe calls for without losing flavour. Be physically active. Get at least 2½ hours of exercise a week. Walking is a good choice. You also may want to do other activities, such as running, swimming, cycling, or playing tennis or team sports. Limit alcohol to 3 drinks a day for men and 2 drinks a day for women. If lifestyle changes don't help enough, your doctor may recommend that you take medicine. When your blood pressure is very high, medicines are needed to lower it. 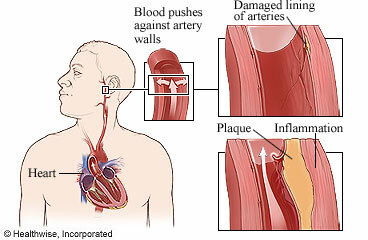 Enter P501 in the search box to learn more about "Learning About High Blood Pressure".